The streets of Barcelona comprise a battlefield which continues to host skirmishes and more enduring clashes between armed police, the civil guard, the army, and local people. The streets of the city have seen fierce clashes over issues such as workers' rights, the all-pervasive and malign influence of the Church, education, Republicanism, a Stalinist coup, national independence, workers' self-management, property speculation, squatters' rights, forced evictions and revolution. 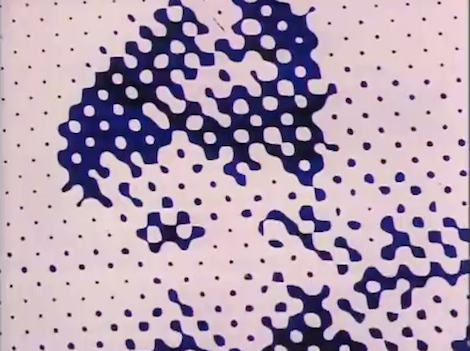 The city is awash with rumours — have they or haven't they? Has a cabal of generals and colonels issued orders to the armed forces to rise against the Republic? Radio and telephone messages from Morocco suggest so. But government censors suppress newspapers and radio stations from broadcasting what little information there is. Anarchist spies in barracks across the city report that a military uprising is set to begin during the early hours of Sunday, July 19th. Local authorities refuse workers' demands for weapons. Activists in the transport workers union take the initiative and raid two ships in the harbour. They expropriate and distribute 200 rifles. 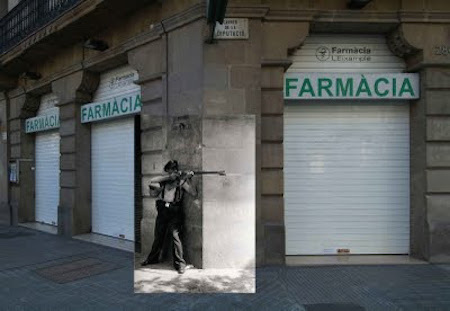 Interminable meetings between representatives of the CNT (Anarcho-Syndicalist union), the police, Assault guards, Guardia Civil and regional government are deadlocked by President Lluís Companys's refusal to arm workers. 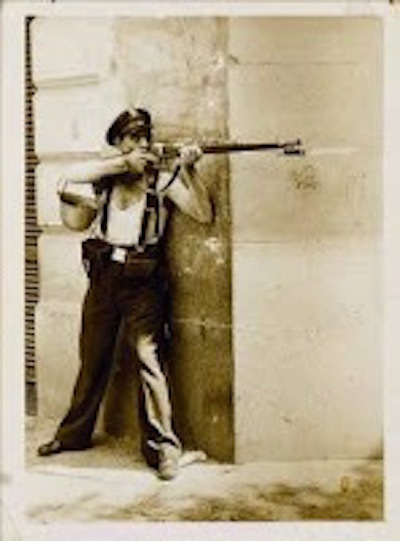 Meanwhile, anarchist militants detain a Guardia Civil courier; he is carrying precise military orders — the uprising is to begin at 5am on Sunday, July 19th. Barricades go up on Paral·lel, Les Rambles and in Sants, Hostafrancs, Poble Nou and Sant Andreu, and in neighbouring Sant Adrìa de Besos. 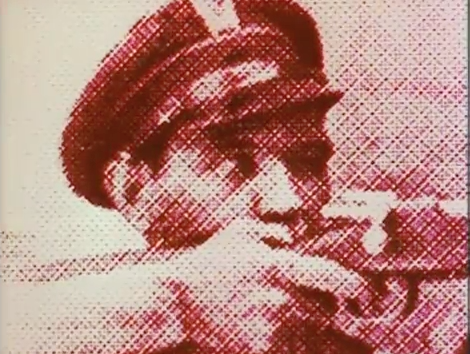 In the early hours of July 19th, 1936, Major José López Amor arrests his seniors and assembles the Badajoz infantry regiment based in the Bruc barracks in Pedralbes and tells them that their orders are to put down an anarchist insurrection. 3.15am: The 400 strong column of infantry, accompanied by a cavalry squad and a rabble of armed Falangists, leave the barracks and proceed along Avinguda Diagonal toward the city centre where they intend to link up with other troops converging on Plaça Catalunya and the Generalitat (Regional Government HQ). Armed workers and neighbours join with loyal members of the Assault Guards to halt the Army's advance on the centre. On Carrer Diputació, a mixed group of civilians and Assault Guards, having overcome an artillery unit, train their guns on a cavalry squadron (from the barracks on Carrer de Lepanto) riding down Passeig de Sant Joan, to prevent them from linking up with mountain troops and more artillery units approaching Plaça Tetuan. The photographer, Agustí Centelles was on hand to create a record of the event. 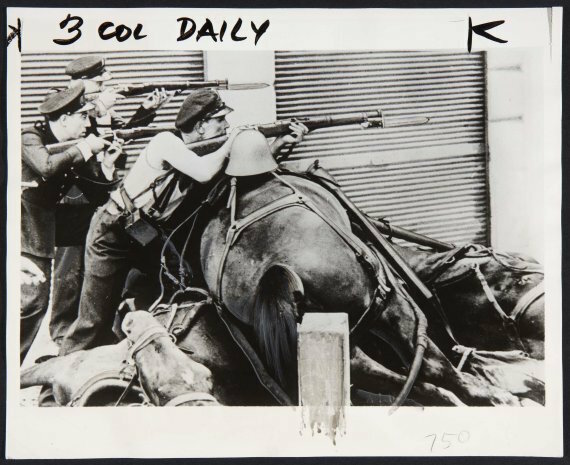 During the same photo shoot — yes, sorry to disappoint, but the photo was staged (on July, 20th) the day following the events depicted — Centelles took more photos of the same asalto (Assault Guard) pictured above using the dead horse as a firing position. 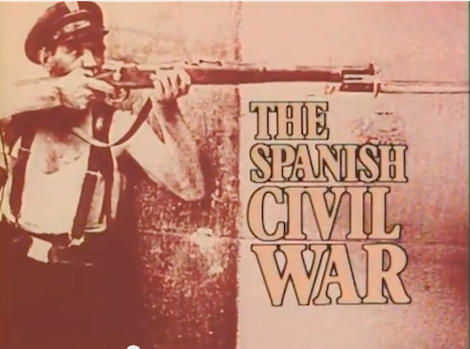 This image was used to great effect in the opening title sequence for UK Granada TV's brilliant, and unsurpassed, 1983 documentary series, The Spanish Civil War. Photo credit: I have mislaid the copyright information for this image. If you are the copyright owner, or know who the copyright owner may be, then do please contact me. Pin showing location of the photo site. You'll find this site in Dreta de l'Eixample at the intersection of Carrer de la Diputació and Carrer de Roger de Flor. If you want to visit the site, it's fairly straightforward — from Plaça Catalunya take the 55 Bus to Plaça Tetuan. The bus will set you down on the corner of Passeig de Sant Joan and Gran Via de les Corts Catalanes from where it is a brief, five-minute stroll. 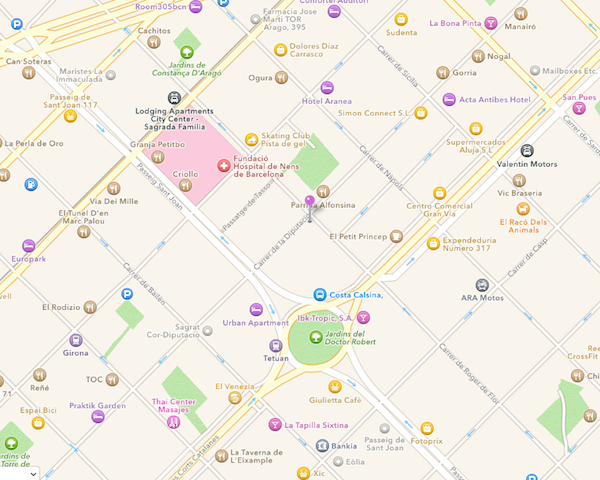 Nearest metro: Tetuan, L2 - Purple.